Pete Morris at Oulton Park giving some hot laps to other 968 enthusiasts. I started sprinting in 1997 in a 3.2 911. Enjoyed class wins for four years then went into Porsche Open club racing in a 964 RS club sport for two years (and never off the podium in class). Bought a 968 club sport and won class 1 in the club championship and second overall. 968 is a well balanced car and a joy to drive. 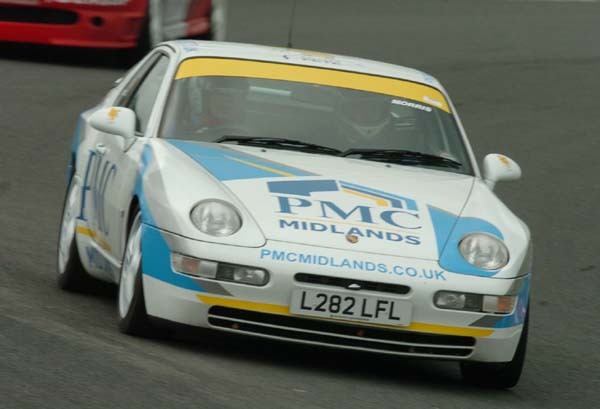 As you see from the pictures I have bought a road car/come track day car and enjoy the benefits from the 968 club sport. Also it looks good in my livery of P.M.C. Midlands .com. I enjoyed taking all of you 968 boys out. Hope you had a good time. P.S. I am now doing a season of British GT in a Porsche 993 GT cup car with Steven Warburton (instructor at Silverstone).